When I entered the room, I got handed over a usb stick with an archive named theinternet.zip (we’ll see what’s inside during the tutorial); the room is packed, the session is beginning in few minutes. the relation between PDE and Tycho : tycho uses the same artifacts (Manifest.mf, build.properties, feature.xml, site.xml) and is actually complementary to PDE UI; but is a competitor to PDE headless mode. Pascal showed some p2 projects being built with Tycho (all p2 projects contained their pom.xml, defining the name of the plugin, and the type : eclipse-plugin or eclipse-feature actually) ; he had also to add a parent pom to be able to build all at once : he cd’ed to to the p2 agregator project and a simple « mvn clean install »; later; tycho began the magic; during the compilation, Pascal talked about is PDE doing compared to tycho (for example the steps order is different) after 1min and a half later; the crowd applauded Pascal : the p2 projects were built; pretty fast. no possibility to build against different JDT versions; code coverage is not provided yet : Igor, Jan and Pascal answered that the API is opened and even though tycho is production ready; some aspects are not yet covered; but anybody can contribute to it to cover more particular aspects. Releasing the p2 repository built by Tycho to Nexus is not available now : to publish p2 repos to Nexus Pro, Sonatype sends a zip file to Nexus that explodes and exposes it; during the year, some hooks will be added to do a better integration between p2 repos built with tycho and Nexus Pro. Coffee break : Pascal is announcing a book about tycho is coming soon (Yai!). Igor then added the build to Hudson : it built fast ! Nexus professional will add support for hosting custom P2 repos (containing your stuff; it will allow you tycho build to publish the built p2 repo to nexus) throughout the year –> I can’t wait for this killer feature! Great presentation & tutorial ! 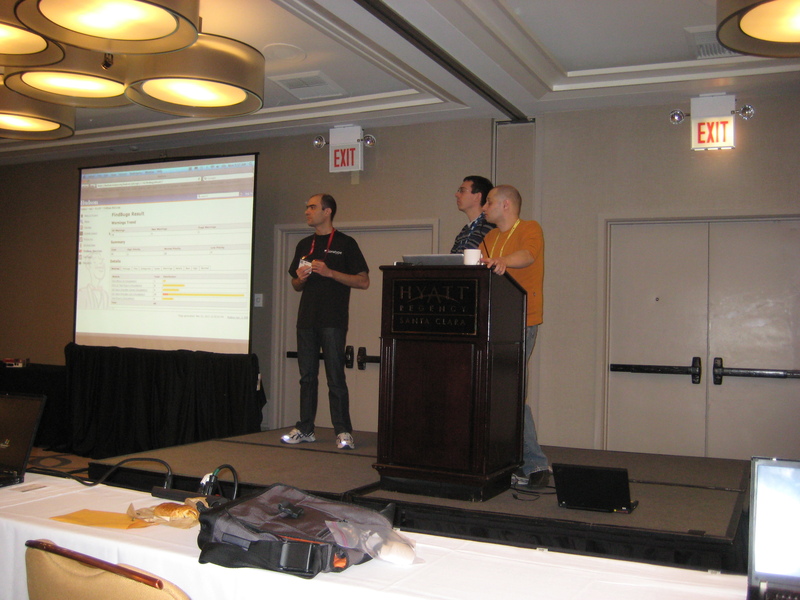 Kudos to Pascal, Jan, and Igor for sharing their knowledge and their patience during the tutorial ! Thank you for the thorough overview and lessons learned with Tycho.